What does a talented woman trying to carry out her trade and passion in a sector dominated my males do? 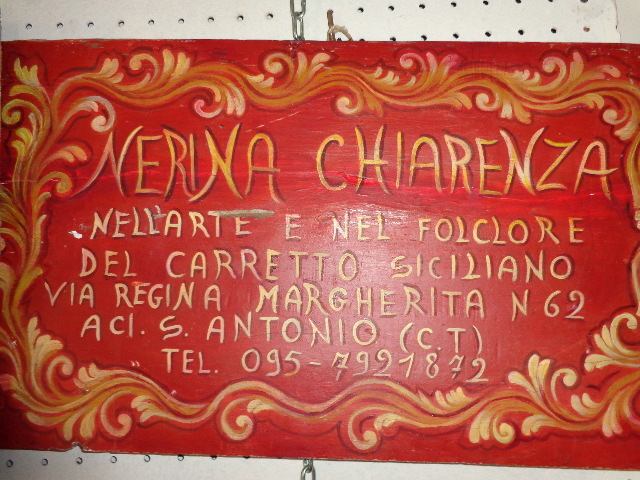 She follows her passion and for forty years Nerina Chiarenza has done just that! Mrs. Chiarenza lives in Aci Sant’Antonio on the foothills of Mt. 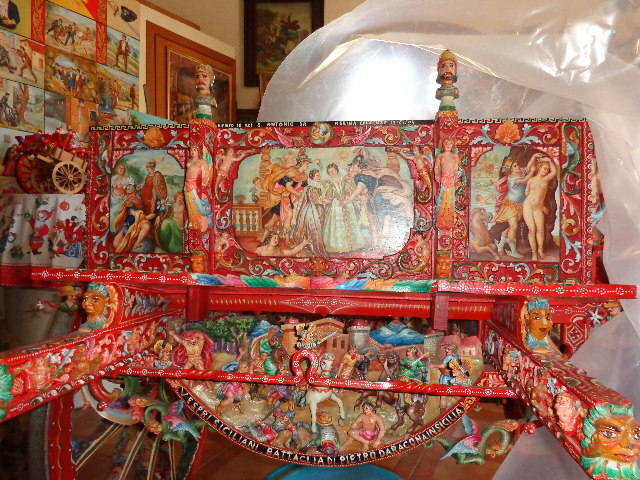 Etna and she is a Sicilian cart painter. I met with her thanks to Marisa who introduced me to her and I was touched when I entered her studio. As I walked in, I just was in awe at all the exceptional artwork around me and I couldn’t help tears rolling down my eyes. I was just moved by this woman whose passion for what she has done for forty years was so evident in each corner of her studio. 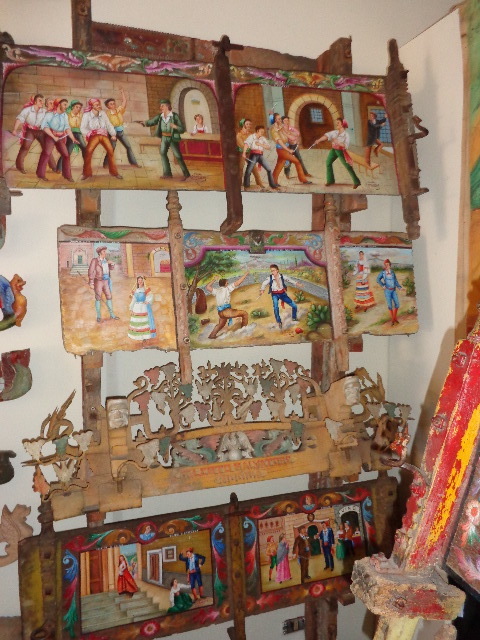 Every piece of work in that studio clearly shows the hard, patient and continuous work that Mrs. Chiarenza has carried out . Upon my arrival, Mrs. Chiarenza showed me so many testimonials of her artwork. She pulled out books that have been written about her and newspaper articles written over the span of forty years; all these testimonials of her long career which she has kept and still bring her so much joy. However, it was obvious, that regardless of the cultural expectations, she has managed to carry out a wonderful career and has received recognition for her accomplishments by many. 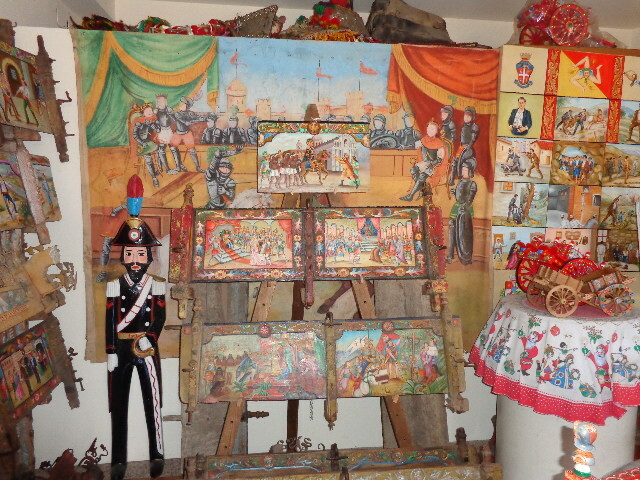 The picture below shows a treasured Sicilian cart in Mrs. Chairenza’s studio. 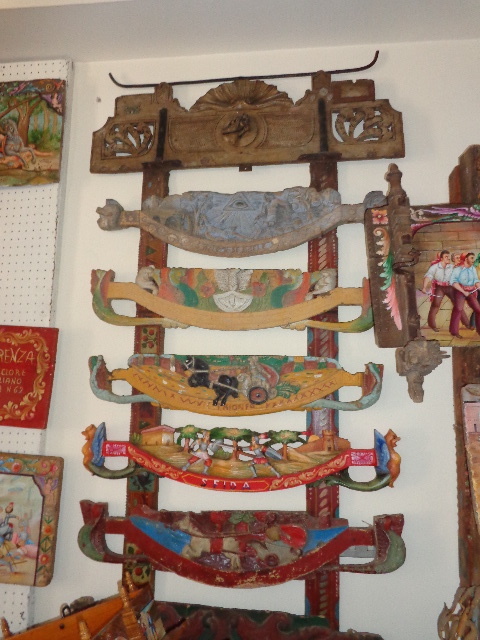 The writing and painting on the bottom of this cart represents “I Vespri Siciliani.” I Vespri Siciliani was a revolt which took place in Sicily in the XIII century. The revolt started at sunset, thus the name “Vespri” from “vespers.” At that time, the land was under French rule; the Angioini ruled and it was a harsh rule. The Sicilian population rebelled and asked the Aragonesi (Spanish) for assistance in fighting the Angioini. The result of this conflict was France and Spain dividing the south – the Aragonesi took Sicily and Sardinia and the Angioini the rest of the South of Italy. 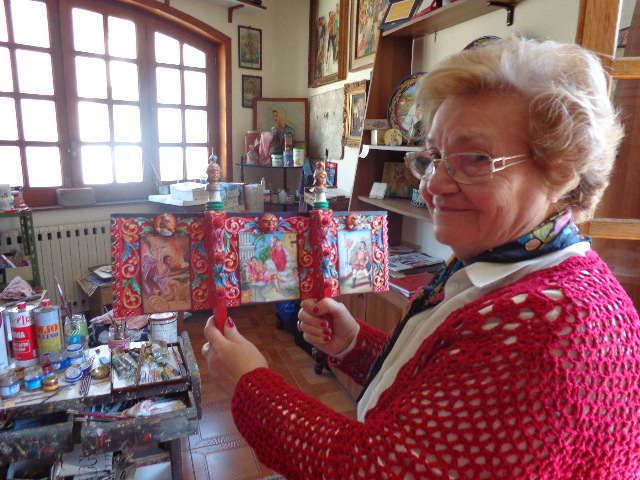 I recently went back to visit Mrs. Nerina Chiarenza, painter and decorator of Sicilian Carts, at her home in Aci Sant’Antonio, and she had just received a letter from the Council Department of Cultural Goods and Sicilian Identity of the Sicilian Region. 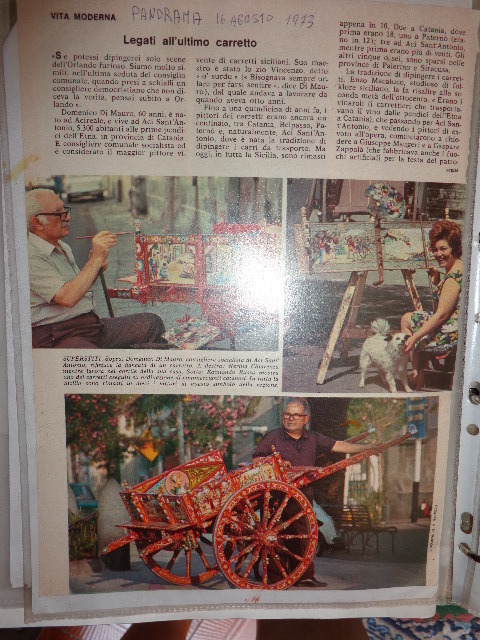 She happily shared the letter which was a notification to Mrs. Chiarenza that she had been entered in the Registry of Intangible Heritage of the Sicilian Region for her work carried out on Sicilian Carts. The provision had been carried out after an evaluation of her personal skills and mastery proven by her work. This action places Mrs. Chiarenza in the Registry of Intangible Cultural Heritage of the Sicilian Region and is found in the Book of Living Human Treasures. Furthermore, the letter stated that this provision will be entered in the list of Intangible Goods of the Sicilian Region which can be found visiting the following website: www.regione.sicilia.it/beniculturali/reis. If i were to see one of these carts in person, as beautiful and creative as they are…I would not be able to resist buying one! Yes, Pamela, they are absolutely beautiful!